The information that IT systems provide helps us understand what is going on in our healthcare system and how we might be able to change dynamics that cause some of our capacity pressures. Chronic disease is having an enormous impact on costs in our health systems at a time when we all need to reduce the deficit. Figure 1 looks at healthcare expenditures across the population. 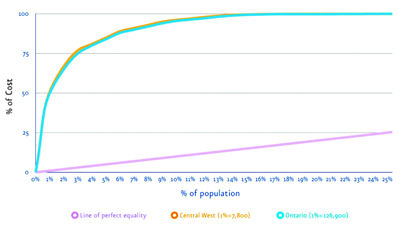 This is the Ontario version of the Kaiser Permanente pyramid, which shows that the majority of resources are actually spent on a relatively small portion of the population. The curve for the Central-West Local Health Integration Network (LHIN) parallels that for Ontario as a whole: about 80% of healthcare resources are being spent on 5% of the population. The William Osler Health System is trying now to identify this 5% within our population. We have found out that 80% are frail seniors, so improvements in the care of this group would potentially have a big impact on the other side of the spectrum and enable investments in preventive programs to slow the onset of disease. It is very helpful for us to start to understand the distribution of our expenses. In Ontario, the term Alternative Level of Care (ALC) refers to patients who are in hospital beds but do not need to be. About 10% of Ontario’s 3,000 hospital beds are occupied by ALC patients. At the same time, on any given day in a Toronto ER, there are about 100 people waiting for one of those beds. As an administrator in the healthcare system, it is hard for me to say we have to open more beds when we are not using the ones we have efficiently. So we looked deeper into those numbers in Toronto and found that the overwhelming majority of ALC patients are designated as such for less than eight days. Patients who are ALC for 100 or 200 days may point to inadequate capacity in long-term-care facilities or other places. However, an ALC lasting eight days reflects process issues, not capacity. When we looked at how discharges were managed in a hospital in Toronto, we found that in up to 40% of patients, discharge planning did not begin until the day of discharge. We also found out that it would take three days on average to sort out and organize a discharge plan. So, in 40% of our discharges, we were building in a three-day ALC problem at the baseline. Only by using information like this are we beginning to understand what is going on in our healthcare system and see what changes will really make a difference. 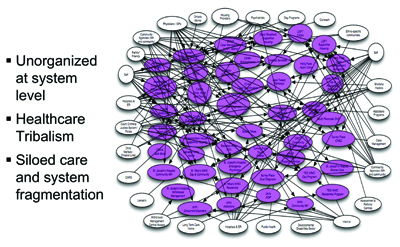 The Wagner model in Figure 2 illustrates what an information-powered healthcare system could look like. It emphasizes decision support systems to move to a more preventive healthcare model. It also emphasizes a prepared and proactive team. The piece I like the most is the informed, “activated” patient. Those of us fortunate enough to live without a chronic disease have difficulty understanding how it can change your relationship with health care and health information. Years ago, I displayed my ignorance at a conference about patients getting involved in their own care and accessing their own information. I made a comment about how it would not do much good to make lab results and images available to patients, because they would not know what to do with them. It took about six seconds before five people who live with a chronic illness pointed out that they want these results and do not need anyone else interpreting them. Patients are very concerned about the latency built into our management of health information: the lab results may be available almost immediately, but they sit somewhere until a provider reviews them and decides when the patient will receive them. People living with chronic illnesses have made it very clear that they would like that information immediately. When I was at the Toronto LHIN, I found out from a couple of small community-based mental health and addiction agencies that when one of their clients did not show up to their clinic appointment, the agencies would put a staff person in a taxi to make the rounds of the ERs around Toronto and find them. Their concern stemmed from the fact that the ER physician would often change the patient’s medication and the caseworker would have no idea the med program had been changed. This is a significant problem for a small group that is easily fixed through the proper application of IT tools. We tried to map out how a person experiences Toronto’s mental health system (Figure 3). There are 65 community mental health and addictions agencies and, as the arrows show, people do not just stop at any one of those agencies; they often have to get supplemental care from some other agency. We brought the agencies together to try and improve the coherence of the available services and get closer to a patient-centred system. Many of those agencies or services are running their own IT systems. The challenge is how to exchange information around these people as they move through the system. Rather than trying to rip out and replace each agency’s legacy system, we need to work at connecting them to exchange information. We are trying to do that now with a project called ‘Connecting the Greater Toronto Area (GTA).’ It would essentially create an information ‘spine’ for the GTA (Figure 4). It is not necessary to have this type of spine on a national or provincial level. The GTA is where 95% of our care happens. For the odd time that a Toronto patient is seen in Ottawa, we can still use the fax machine. In developing a local spine, it is very important that we do not just focus on hospitals as we have done too often in the past. The majority of the patient flow is not between the hospitals, but between a hospital and primary care agencies as well as community care agencies. That is where we really need interconnectivity. The resistance I encounter is largely from people who think an electronic patient record is simply about taking a paper form and making it electronic. Clearly, more work needs to be done to change this perception, and Infoway is wise to take on this idea of building social capital. Ontario is now very focused on reducing ER wait times, with a very public commitment by government. For me as a hospital administrator, this is a very exciting agenda. The challenges in the ER only marginally concern what is happening in the hospital. 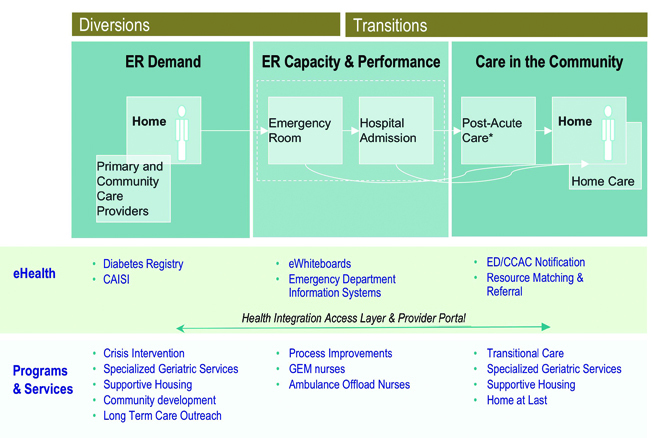 It is the entire healthcare continuum we are really going to have to look at if we are going to make a difference in our ER wait times. At the bottom of Figure 4 are some of the IT systems we have put in place to move patients through the system and get them home again. Below the line are non-IT initiatives to soften demand, improve capacity, or get people home. In diabetes, for example, we need to develop tools to support primary care to reduce unnecessary demand. We are trying to get a diabetes registry up and running that would provide practice-level reports to GPs and allow them to improve their management of patients with diabetes. We have had some success, but will only be able to monitor the system and provide feedback once the information systems of various organizations are linked. Last year, William Osler saw over 20% year-over-year growth in ER use. The overwhelming majority were low-acuity patients who are not getting the right support at the primary level and are coming to the ER for those services. We need to bring in systems that change that paradigm for us. Care in the community needs to be strengthened and coordinated. In Toronto, we instituted a resource matching and referral system that has had a very substantial effect on moving patients through the system. Its primary payback has been around equity of access, especially in referrals. With 177 organizations out there, it is impossible for anybody to know all the services available to their patients. The matching system enables physicians to enter the information they are looking for and find out what is available and how long the wait might be. The system has had a big impact on wait times as we have started to see where latency has been built into our healthcare system. This has produced significant changes in behaviour. For example, there was great variation in how long it took to get someone moved from an acute-care hospital to a rehab hospital. Some rehab hospitals would respond within eight hours of a referral; others took up to seven days to let a doctor know if they were going to take a patient or not, obliging the doctor to send out multiple requests. We have not yet handed the resource matching referral system over to patients — the establishment cannot fathom patients being able to book their own procedures. So for now, only doctors and nurses use the system. At William Osler, our vision statement is “to design health systems that serve the global community.” We are working with the Board on the concept of the healthcare continuum, the part our institutions will play in that continuum, and how we will interact with the institutions and agencies that provide services outside our scope. Our goal is for the people we serve to experience health care as one system, and we will not be able to reach that until we have the information systems in place. Certainly, as hospitals, we cannot just work within our boundaries. We have to work with our community agencies, our family health teams and other specialized centres to make the pieces work together as one healthcare system for our patients. Mr. Anderson came to the William Osler Health System in April 2010. One of the largest community hospital systems in Canada, its three hospital sites provide a comprehensive range of acute care, ambulatory and ancillary health services. Mr. Anderson served previously as the CEO of the Toronto Central Local Health Integration Network (LHIN), responsible for the local planning, measuring and funding of 177 organizations (long-term care homes, community care access centres, community health centres, community support services, hospitals, and mental health and addiction agencies) that serve more than 1.15 million Ontarians. 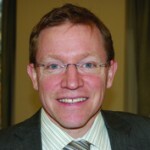 Mr. Anderson held previously the position of Senior Vice-President of Performance and Technology at the University Health Network, where he led the information, quality management and technology portfolios.